In this day and age of reducing waste and our impact on the earth, refurbishing furniture is an excellent way to fix and reuse quality items that need a little TLC. Refinishing furniture requires several skills. 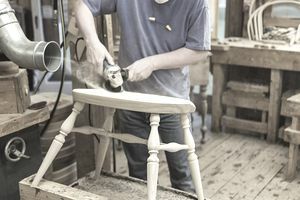 Furniture repair needs a knowledge of carpentry to fix broken items, such as loosening stuck drawers or re-setting legs. Refinishing involves stripping away paint or the old finish, sanding, and applying a coat of paint or stain. Some items might require reupholstering; the replacement and recovering of fabric-covered items. Some pieces of furniture might need all three tasks to bring them back to life, while others need just one or two. As the owner of a furniture refinishing business, you can earn a home-based income fixing items either brought to your location or on site (if space and equipment allows). Or, you can find furniture in need of TLC, refinish it, and then sell it. You can earn a home-based income working with your hands. You can build a client base working with people who love antiques and are willing to pay for custom refinishing. Set your own hours, whether it's late at night, around your existing job, or part-time as a side-hustle. By having a home workshop, you save on the overhead of having to rent a store-front or workshop. If you already have space and equipment to refinish furniture, your startup expenses can be low. It can take time to build up consistent clientele. Competition can be stiff in some part of the country. Pricing your services can be a challenge as you need to figure out the cost of materials, time involved in the work, and your overhead. Because each item is different, with various levels of need, you'll need to provide individual estimates for each piece of work. Furniture repair is solitary work, which can get lonely. Some aspects of fixing furniture can be dangerous, such as toxic stripping agents. You'll want to make sure you use all safety precautions to avoid injury or illness related to the work. A home-based furniture business requires many of the same tasks as any other business and a few specific to furniture repair. If you plan to refurbish furniture in your home, check with the zoning laws in your area, and obtain a waiver or variance if it is necessary. Because working with furniture may involve extra noise or fumes, it's possible you won't be able to run your business from a residential neighborhood. Check the competition in your area by visiting the website of your local Chamber of Commerce, which will list all the businesses registered with the Chamber. From their website, you can look for other furniture refinishers to get a sense of how many competitors are in your town or county. Choose a business name and your business structure. Obtain a business license from your city or county business office. Often you can apply for a license online from your locality's website. Buy refinishing equipment and supplies, including strippers and sanding tools you don't already own. Set up a well-ventilated workspace and safety equipment to help you avoid inhaling toxic chemical fumes. Take professional before-and-after photos of work you've done, even if it's on your own furniture or inexpensive test pieces you might find at a garage sale or flea market. The improvements should be dramatic enough to highlight your skills. Create marketing materials such as business cards, advertising for print and online, vehicle signage, and a website to promote your business. Begin networking to build relationships with antique dealers, flea markets, and collectors to spread the word about your services and promote repeat business. Consider having a display at flea markets, trade shows, and home expositions. Set up your bookkeeping and consider hiring an accountant if you don’t have one. Provide quality service and deliver your products on time to encourage referrals and repeat business.